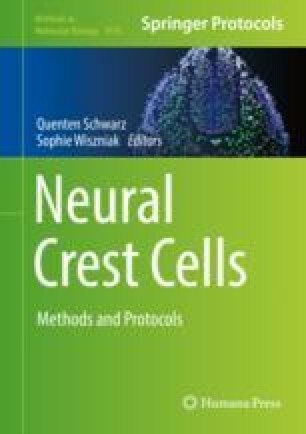 The neural crest is an embryonic cell population induced at the border of the neural plate from where it delaminates and migrates long distances across the embryo. Due to its extraordinary migratory capabilities, the neural crest has become a powerful system to study cellular and molecular aspects of collective and single cell migration both in vivo and in vitro. Here we provide detailed protocols used to perform quantitative analysis of molecular and cellular aspects of Xenopus laevis neural crest cell migration, both in vivo and in vitro. Elias H. Barriga and Adam Shellard contributed equally to this work. This study was supported by grants from MRC (M010465 and J000655) and BBSRC (M008517) and Wellcome Trust to R.M., an EMBO Long-Term Fellowship and a Marie Curie Fellowship (329968) to E.H.B., and a Wellcome Trust fellowship to A.S.